The electric vehicle (EV) industry is growing every day. Between dedicated EV manufacturers and traditional auto manufacturers developing more and more hybrid or all-EV offerings, it’s clear that most manufacturers see the shift from mechanical to automated electric vehicles crucial for future success. It’s also clear that developing and building complex systems like EVs—to strict timelines and cost calculations—means manufacturers need systems able to handle extraordinary complexity. Goals to boost battery life and capacity in efforts to extend the range of vehicles as well as power has created new challenges in the design and development process. That’s where Adaptive and Dassault’s 3DEXPERIENCE PLM platform have you covered, from, generative design and simulation to balancing product performance with increasing design complexity and cost. PLM technology enhances every aspect of product design and development. It allows for rapid design experimentation and evolution thanks to built-in simulation tools and additive manufacturing tie-ins for rapid prototyping and testing. Overall, it streamlines and speeds up the product design and creation process, making it faster and easier for manufacturers to get new ideas to market. A key step in product development, design means taking all of the available requirements and data and developing the end product in a CAD system, such as CATIA in 3DEXPERIENCE. Manufacturers who make use of an advanced CAD system tuned to the particular needs of electric vehicle manufacturers can perform highly complex, generative design and analysis tasks, incorporating human mechanics and virtual reality, and even reverse engineering physical parts. In addition, embedded collaboration tools in advanced CAD platforms also introduce the web into tools used for marketing, creating high quality rendering or animations, which helps teams create marketing information and technical documentation for regulatory purposes much earlier in the design cycle. CST Studio Suite®, a high-performance 3D electromagnetic (EM) analysis software package, meets design, analysis, and optimization needs for EM components and systems. Wave6, the next-generation vibro- and aero-vibro-acoustic simulation tool offers a wide variety of industry application simulations and unique analysis methods that efficiently and accurately simulate noise and vibration across the audible frequency range. XFlow , from the SIMULIA Fluids Simulation portfolio includes particle-based Lattice-Boltzmann technology for high fidelity computational fluid dynamics (CFD). 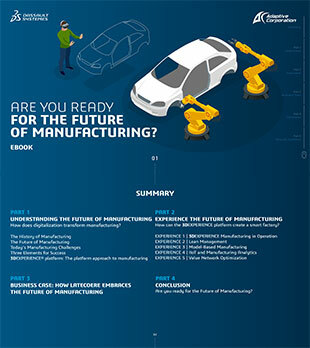 Virtual manufacturing, or modeling the production process, is the next step of testing. With DELMIA, our virtual manufacturing solutions, you can plan, simulate, and model your global production processes—virtually experiencing every step in the entire factory production-line for your design, all the way to delivery. By testing this process digitally, manufacturers can better analyze their product concepts to make the best decisions about optimizing their production approach—and save significant time and cost later. Additive manufacturing processes bring the ease and speed of the digital world into the physical one, allowing for rapid prototyping, quick tooling production, or even custom part creation. Depending on the AM process and materials, product components can be created quickly for the purposes of testing or even for use by the consumer. As an aid to testing, our Markforged 3D printers with metal or carbon fiber materials allow for quick, inexpensive physical parts to validate fit and function. As a production tool, AM can generate tooling to support more mass-produced items or even deliver custom parts. Inspection and metrology solutions help you ensure your products meet design performance criteria and compliance requirements and support both inspection and reverse engineering applications. With our Creaform 3D-scanners, you can scan products, tools, or parts that need to be reworked and improved. Create 3D, digital images from 3D scans in a CAD system and quickly drive new innovations, e redesign and analyze for compliance with customer requirements, as well as a variety of standards. In addition, the 3DEXPERIENCE PLM platform includes inspection and reporting processes that help you implement quality methodologies (APQP and PPAP) and other best practices for critical processes that improve vehicle quality. The heart of the 3DEXPERIENCE platform is the idea of business intelligence: a single location for every bit of product, customer, supplier, or operational data that is relevant to your organization. Typically, at a company, this is stored across multiple, disparate, and often siloed systems—most of which never communicate. Extra effort is required to collate information, make it meaningful to the company, and impact the bottom line. Eliminate duplicate part data and quickly identify all related parts with our One Part search in our EXALEAD solution. A unified solution transforms large volumes of heterogeneous, multi-source data into meaningful, real-time information intelligence to help you improve business processes and gain competitive advantage. Communication is a company’s lifeblood, and getting the right information at the right time is crucial to an efficient PLM process. That’s why Adaptive’s ENOVIA solution centers on the 3DEXPERIENCE PLM platform, which provides a comprehensive toolset for connecting content, context, and process across the office or across the globe—ensuring communication and collaboration about every aspect of a project, between every person, and at every stage of the product lifecycle. Our solutions enable global collaborative innovation, online creation and collaboration, mobile collaboration, one single platform for IP management, scheduling collaboration, a lifelike experience, and a lower total cost of ownership and quick ROI.